This page created Jan. 2016, last updated 1/28/2016. 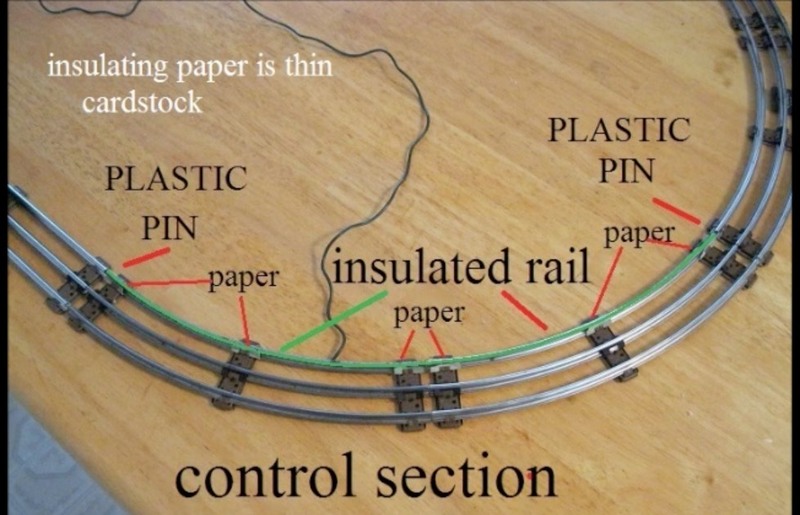 This page attempts to describe how to control two 3-rail Lionel trains on the same loop of track, by using a very SIMPLE method consisting of 2 track blocks and 1 connecting wire, and NO relays. 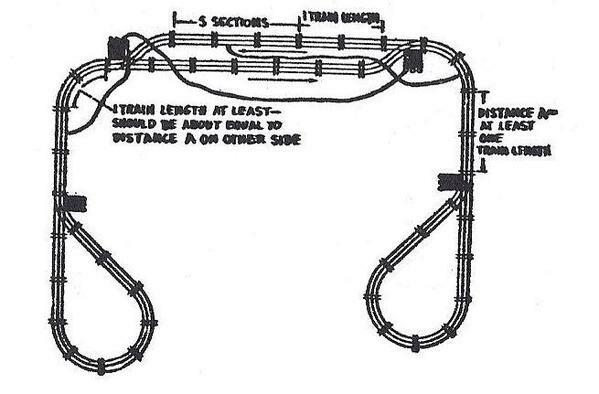 You can control two 3-rail Lionel trains on the same loop of track, by using 2 blocks, 1 wire, and NO relays. 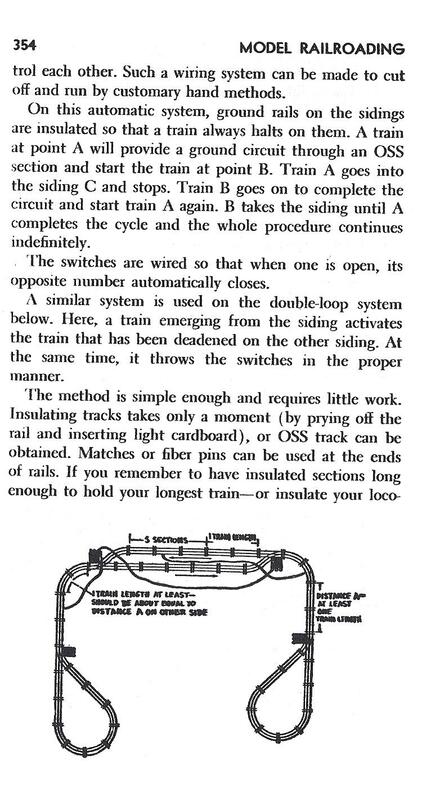 I’ve seen the wiring diagram in Classic Toy Trains in the past, but have not been able to find it on the internet — except in a Youtube video made by a gentleman named Joseph Rampolla, which is included below as Video #2. 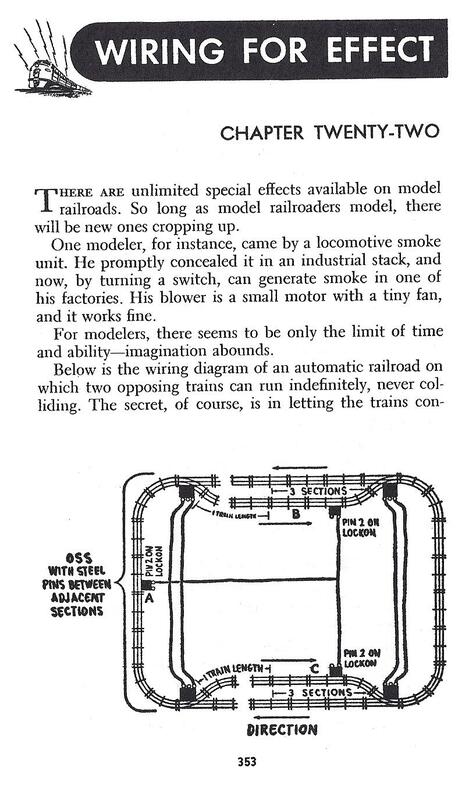 If you Google phrases similar to “3-rail block control with no relays for running two trains on one track“, the results show scads of diagrams involving relays and electronics — but not the simple 1-wire circuit. Therefore: I have created this page of notes. Note that down below the following diagrams, are links to several VIDEOS. 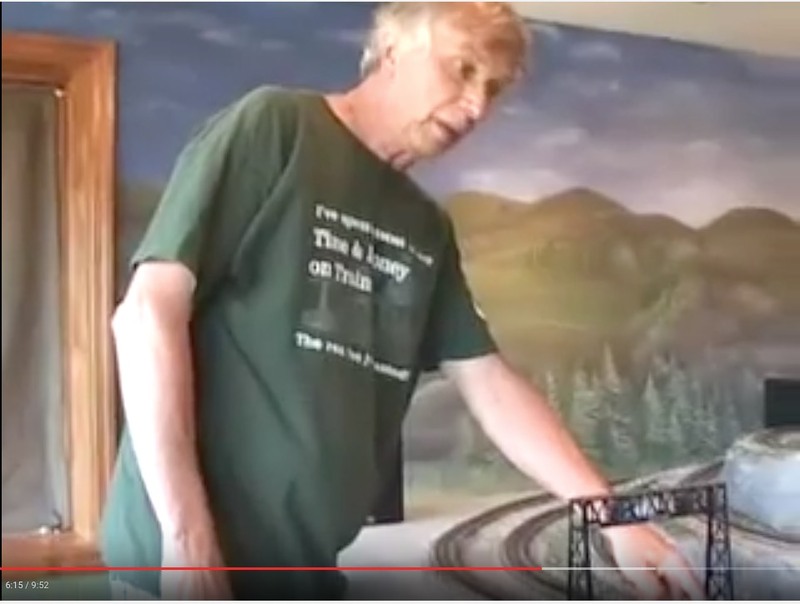 Image 1 – Rob Mueller explaining the “Control Section” of the 3-rail ‘1-Wire No Relays Block’ that controls 2 trains on 1 loop of track — on his Pine Summit Railroad (Screen capture from Video 1 below). Image 4 – Wiring Diagram for the “1-Wire No Relays Block” (from Joseph Rampolla’s Youtube video). The “Control Block” is on the upper left. 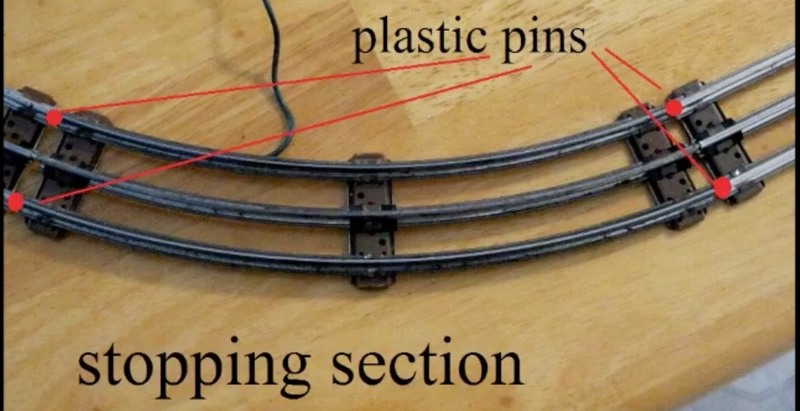 Since with Lionel track the metal ties normally connect the 2 outside rails, you have to insulate the inside rail of the Control Block (as shown in green between the 2 plastic pins). The “Stop Block” is on the upper right. 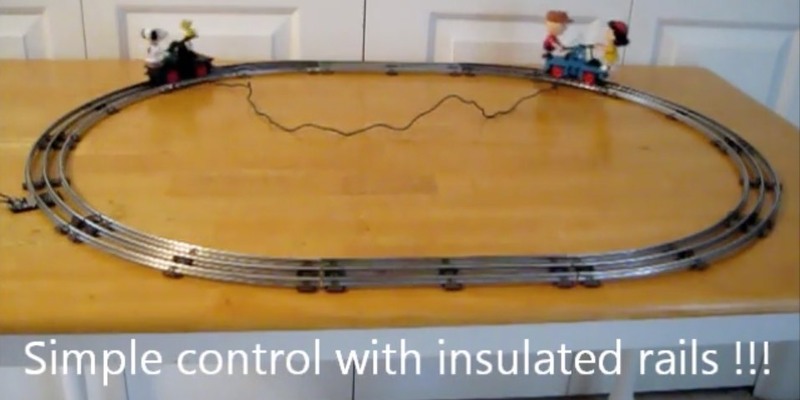 Note the 2 outside rails do NOT require any insulation, since they are either BOTH normally OFF, or BOTH are ON when a train is in the “Control Block”. Image 5 – The “Control Block” Note how Joe has used cardboard to insulate the inside rail in the Control Block (rail shown in green). From about the 4:40 point to the 8:15 point in the video — the layout owner Rob Mueller explains how the “1-Wire No Relays Block” works. 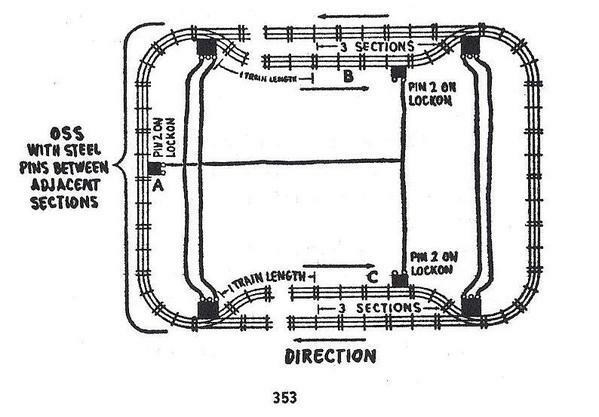 * Test stopping distance of trains at maximum speed to be operated, with maximum load of cars (to include “momentum effect” of cars) — to estimate the minimum required length of the “stop block”. Add the length of several more sections –for a “safety zone”. This would be the estimated length of the “stop block”. Photos of this railroad can be seen in Rob’s Picasa album and also at PineSummitRR.com. Video #2 – by Joseph Rampolla. The above Images 2 thru 6 were ‘screen-captured’ from this video. For 1st part up to about 1:40, the narrator is describing essentially what we are calling the “Control Block“. 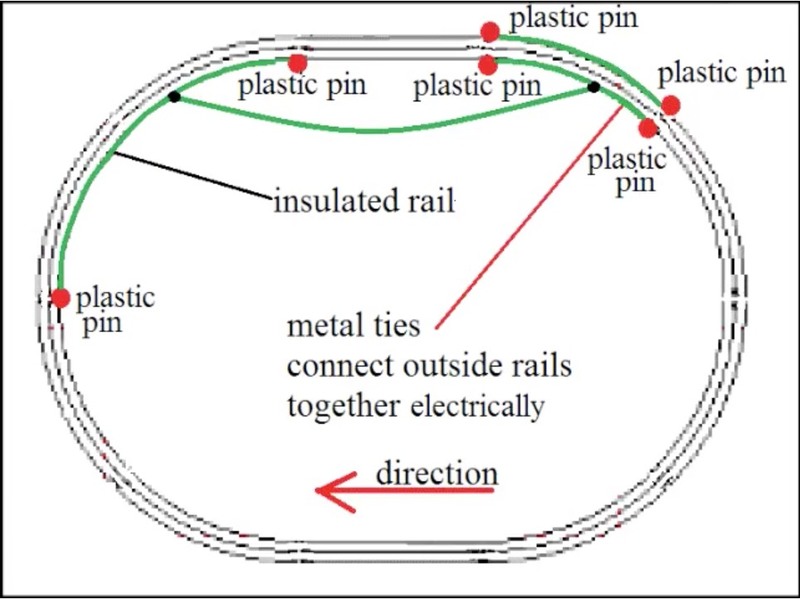 The wire that you see in the above image, that is coming off the top rail, would be connected to our “Stop Block“. I searched the above two sites, but could not find any reference to the simple “Relay-less Block” that we are discussing on this page. Note that we’re “changing gears” now. This video uses reed switches and relays, NOT the “Relay-less Block” described on the first part of this web page.